I got to thinking about something one of my friends said a few weeks back about buying cards during the release of a new set. Their thinking was that not all cards need a play full play set. 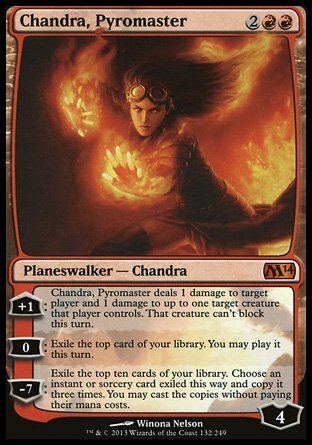 Some things such as removal (Hero’s Downfall) are definite 4 ofs in a deck, but other cards such as planeswalkers need only 2-3 most of the time. The problem some of us run into is that we sometimes have more cards than we need. This is especially important to think about when prices of cards hit their peaks. Pro Tour Khans of Tarkir took place on October 10th-12th, and the results of the event will affect MTG at least until the next set comes out in January. While we have to consider future sets putting both upward and downward pressure on prices, being able to read the metagame and knowing when to cash out is important. I’d like to accomplish 2 things with this article. The first thing is to go over the cards currently in standard and to identify which cards are 2 of, which are 3 ofs, and which can be played in a playset. By doing so, I’m hoping both my readers and myself can become more efficient traders and buyers. If we can sell our extra cards and buy less than what we need, we’ll have more money to get other cards we might need or that we want to invest in. The other thing I’d like to do in this article is to talk about the mistakes we make when buying or trading for cards and how to recognize when doing so is against our best interest. Decks that use Four ofs, or as we say a “play set” or cards tend to value consistency more than anything else. These are cards that players want to draw early and in large numbers. Aggro decks tend to have a lot of four ofs, and most removal comes in fours as well. Below you can find a list of the cards currently in standard that are usually found in decks as a play set. While you might not always find these cards as a four of, decks can usually support them as a 4 or have done so before. For the sake of space, I’ll keep the list down to only playable rares and mythic rares. These are the cards you always want to keep 4 of in your collection if you’re going to be playing standard. These are also the cards that usually hold the most value and see the highest spikes. The more decks that use these as a four of, the higher the price will go. 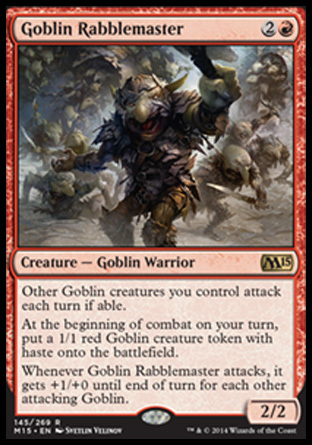 Take a look at Thoughtseize ($20) or Goblin Rabblemaster ($20) for example. These are probably the easiest cards to trade away, and you can usually get a good sell price for them. If you get a 5th or 6th copy, it goes without saying that you should sell the card if you can get a good price. Make sure you pay attention to the metagame and read up on how other cards interact with and against these cards to sell them at their peak. If a powerful card that buy-lists for $20 suddenly gets hated out by the metagame, you could see a price drop in a matter of days. If you’re sitting on extra copies hoping for them to go up, that would be a good time to sell. Three ofs are a little bit different than a play set of a card. When people are only using 3 of a certain card in any given deck, it probably means that there is some sort of restriction keeping you from playing that fourth copy. 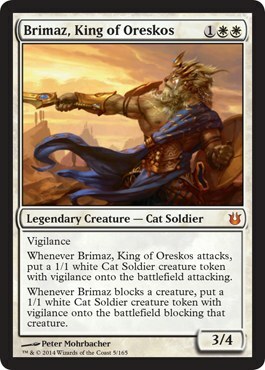 It could be the Legend rule such as with Brimaz, King of Oreskos, but you could also be hampered by the mana cost such as with Fated Retribution. Here are cards that I think are mostly 3 ofs in a deck. Some of these cards could probably be played as a 4 of in some decks, but for the most part I see them as being 3 ofs. With these cards, you’d probably be better off selling or trading anything over 3 copies. Most decks can’t support 3 Brimaz, so why buy a 4th or hold onto him? He’s worth a heck of a lot now and you can make a pretty penny from selling him. I’ve made the mistake of buying a playset of a card because I thought I had to for the metagame, only to end up never using the 4th card. I would have been much better off spending that money on another card I needed, or selling the extras at their peak to make a profit. When you get down to cards that there are only 2 of in a deck, we tend to get a lot of cards that are strong but have a limited scope or affect. An example would be the gods from Theros block. Unless you’re playing a devotion based deck, activating them can be rather difficult. However, you can’t look past Keranos, God of Storms effects in a Temur deck, or Purphoros, God of the Forge in a tokens based deck. They have strong effects, but they aren’t really cards you want 3 or 4 of in your deck. Lots of these 2-of cards are also in sideboards, and some Planeswalkers fall into this camp as well. There might be a select few cards from this list that you’d like to play 3 of, but I think for the most part you’d only play 2 if you were going to play them in the main deck. Lots of these cards need others to work well, so I don’t see them becoming staples any time soon. One is the loneliest number. There are very few cards that fit into this category. When you’re only playing one of a card in your main or sideboard, you’re basically playing it as a silver bullet effect. It can be really strong on it’s own, but the cost could be restrictive or it could have a potential side effect. These cards probably won’t hold their value long if at all in the current format. I think they all have very strong effects on a game, but as I said before their scope is rather limited. Garruk is amazing against all the midrange decks out there with tons of planeswalkers, but that 7 mana casting cost really hurts his playablity. Liliana is also a great sideboard card against control, but doesn’t do much besides tutor for you. If there are any creatures on the board and you can’t protect her she’s dead. These are cards that perhaps you would want 2 of, but in all reality you probably won’t be playing more than 1 in a deck at any give time. There are 7 sins of Magic Players, more specifically, sins of those who invest in Magic cards. I must admit I’ve been guilty of a few of these before. You might be wondering what I’m talking about. Greed – Wanting too much money for a card or waiting for a card to go up. You can lose out on a good trade or the bubble can burst and you’ll be screwed. Pride – Developing an attachment to a card because of a special event. Sure cards can have sentimental value, but why hold onto that top 8 Game Day Promo just to show people that you made the top 8? Wrath – Getting angry when you find out the card you traded away was worth more or the card you got was worth less. Always be an informed buyer/trader. Sloth – We put off buying a card until it’s already spiked, or selling a card when it’s already gone down. We are all sinners and must confess to be forgiven for our trespasses . . . at least when it comes to buying and trading Magic cards. I’m sure somebody has gone over this topic before, but it never hurts to talk about it again, especially in the current Magic environment. Before you make any type of trade or purchase in the future, I want you to think long and hard about your transaction. Of course you need to think of whether the card is a 1, 2, 3, or 4 of in a deck and value it accordingly. 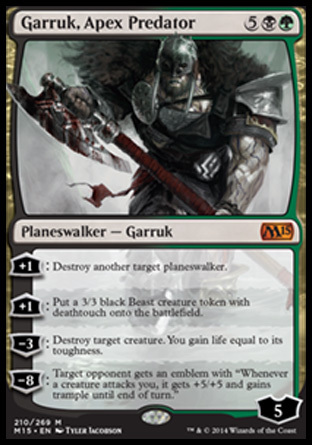 Do you really want to trade for that Garruk, Apex Predator at $20 soon after release? Is it worth picking up a play set of Spear of Heliod? If you don’t consider how the card fits into decks and evaluate it well, you might be kicking yourself down the road. The better you get as a trader/buyer, the easier it will be to put your decks together in the future and transitioning to a new metagame should be a breeze. Keep it in mind! Very good read, lots of great information and things to think about.